Here you have my version of the famous Drow. Not much to say about him, as many of you already know him so well thru the books. 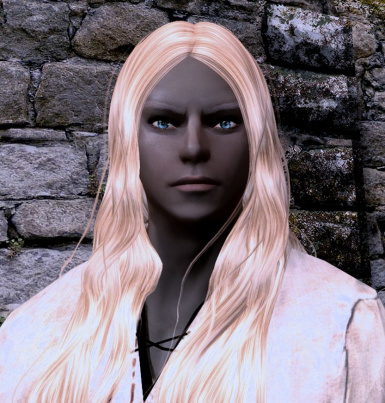 Credits goes to tktk1 for the Enhanced Character Edit mod, Apachii for her Skyhair mod and Aluminumfoil for the Eyebrows match hair mod at old Skyrim Nexus. Thank you very much for making Drizzt and many other characters of mine possible! You will need the Enhanced Character Edit mod and also Apachii Sky hair, the latest one. + The eyebrows match hair mod from old Skyrim. Othervise you won't get the white brows. And yes, I know that the colour of his eyes aren't spot on. Hope that you can live with that anyway? He own Breezehome and have 5000 Septims in his purse. No main quest are going on as I run the Live another life mod. So you can decide Drizzt's agenda as you like. This Black Panther follower in the role of Guenhywar, Drizzt's faithful companion. Drizzt's sword Twinkle. You can get Icingdeath too by smithing a second Twinkle and then enchant and rename it.